Credit: Courtesy of Oleg Sutormin. A team from the Institute of Fundamental Biology and Biotechnology of SFU used glycerol and sucrose to simulate the intracellular environment of luminescent bacteria and carried out a number of enzymatic reactions in it. The work will help develop fragments of metabolic chains with different lengths and study fermentative reactions in the conditions close to intracellular. The article of the scientists was published in the Molecular Catalysis journal. Hundreds of reactions involving enzymes constantly take place in real cells. To study them in more detail, scientists from all over the world try to create comprehensive experimental models of the intracellular environment. One interesting feature of such artificial environment-models is the possibility to adjust their parameters to understand how a certain enzymatic reaction would react to that and how different the nature of enzyme reactions is in a real cell and in tube conditions. In order to understand how the viscosity of the reaction mixture affects the rate of enzymatic processes, a team from the Institute of Fundamental Biology and Biotechnology of SFU simulated the intracellular environment using two organic solvents – glycerol and sucrose. To test the effect of viscosity of reaction mixture, the scientists placed a fragment of a bioluminescent metabolic chain into such environment (bioluminescence is the ability of living organisms to emit light, observed, for example, in fireflies or marine bacteria). The work of the scientists consisted of three stages. On the first stage the biophysicists developed several artificial model systems made of glycerol and sucrose with different concentrations of components but the same viscosity levels of reaction medium. On the second stage they found out how the viscosity of the reaction mixture affected the speed of a enzymatic reaction in the coupled system of three enzymes: LDH, NAD(P)H:FMN-oxidoreductase, and luciferase. On the third stage the researchers evaluated the thermal stability of the triple-enzyme system at the range of temperatures from 15 to 80°?. As a result of the study the scientists concluded that sucrose limited the mobility of the enzymes more efficiently than glycerol. Mobility limitation may lead to changes in the reaction rate or even mechanism. Moreover, the study showed that the increasing of thermal stability of enzymes in the presence of viscous reaction mixture environments while increasing temperature should be speculated more detailed by other researchers. 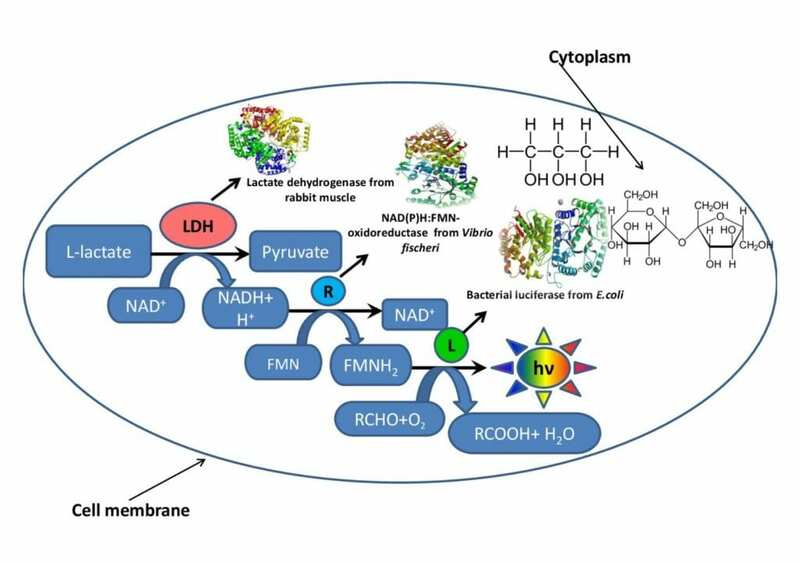 Another result of the study was that the approach of constructing the cellular multi-enzyme metabolic chains inside the luminous bacteria cell was proposed. "Due to the huge number of enzymes reactions inside a real cell, for the process of metabolism to go on quickly and continuously within it, enzymes should have high cooperativity (i.e. be able to bind with different substances (substrates) depending on their location). Therefore, the more changing of the thermal stability of enzymes in the presence of viscogens, the better the cooperation of studied enzyme systems inside the real-cell conditions, and the greater the possibility that an artificial fragment of a metabolic chain would be natural for a bacterial cell. It is extremely important to study the influence of viscous organic solvents on the rate and thermal stability of enzymatic reactions. The uniqueness of our study is that we use natural compounds – glycerol and sucrose that are actually found in the real cell, in contrast to crowding agents that are used in similar studies by other researchers," says Oleg Sutormin, a co-author of the study, and junior research associate of the Laboratory of Bioluminescent Biotechnologies of SFU.